^ 5.0 5.1 Weidhorn, Manfred. The Person of the Millennium: The Unique Impact of Galileo on World History. iUniverse. 2005: 155. ISBN 0-595-36877-8. ^ O'Connor, J. J.; Robertson, E. F. "Galileo Galilei". The MacTutor History of Mathematics archive. University of St Andrews, Scotland. Retrieved 2007-07-24. ^ Sobel（2000, p. 5）Chapter 1. Retrieved on 26 August 2007. "But because he never married Virginia's mother, he deemed the girl herself unmarriageable. Soon after her 13th birthday, he placed her at the Convent of San Matteo in Arcetri." ^ Pedersen, O.（24–27 May 1984）. "Galileo's Religion". Proceedings of the Cracow Conference, The Galileo affair: A meeting of faith and science. Cracow: Dordrecht, D. Reidel Publishing Co.. pp. 75–102. Bibcode 1985gamf.conf...75P. ^ 23.0 23.1 Panofsky, Erwin (1956). "Galileo as a Critic of the Arts: Aesthetic Attitude and Scientific Thought". Isis 47 (1): 3–15. doi:10.1086/348450. JSTOR 227542. ^ Rutkin, H. Darrel. "Galileo, Astrology, and the Scientific Revolution: Another Look". Program in History & Philosophy of Science & Technology, Stanford University. Retrieved 2007-04-15. ^ Carney, Jo Eldridge. Renaissance and Reformation, 1500–1620: a. Greenwood Publishing Group. 2000. ISBN 0-313-30574-9. ^ Shea & Artigas（2003, p. 199）; Sobel（2000, p. 378）. ^ Shea & Artigas（2003, p. 199）; Sobel（2000, p. 378）; Sharratt（1994, p. 207）; Favaro（1906,18:378–80） (Italian). ^ Shea & Artigas（2003, p. 199）; Sobel（2000, p. 380）. ^ Shea & Artigas（2003, p. 200）; Sobel（2000, pp. 380–384）. ^ Middle finger of Galileo's right hand, Museo Galileo. Accessed on line 27 May 2011. ^ Einstein（1954, p.271）. "Propositions arrived at by purely logical means are completely empty as regards reality. Because Galileo realised this, and particularly because he drummed it into the scientific world, he is the father of modern physics—indeed, of modern science altogether." ^ Fischer, Daniel (2001). Mission Jupiter: The Spectacular Journey of the Galileo Spacecraft. Springer. pp. v. ISBN 978-0-387-98764-4. ^ United Nations Educational, Scientific and Cultural Organization (11 August 2005). "Proclamation of 2009 as International year of Astronomy"（PDF）. UNESCO. Retrieved 2008-06-10. ^ Cohen, H. F.（1984）. Quantifying Music: The Science of Music at. Springer. pp. 78–84. ISBN 978-90-277-1637-8. ^ Field, Judith Veronica (2005). Piero Della Francesca: A Mathematician's Art. Yale University Press. pp. 317–320. ISBN 978-0-300-10342-7. ^ Kusukawa, Sachiko. "Starry Messenger: The Telescope". Department of History and Philosophy of Science of the University of Cambridge. Retrieved 2007-03-10. ^ Drake（1960, pp.vii, xxiii–xxiv）, Sharratt（1994, pp. 139–140）. ^ Drake（1978, p. 268）, Grassi（1960a, p. 16）. ^ Drake（1957, p. 222）, Drake（1960, p.xvii）. ^ Sharratt（1994, p. 135）, Drake（1960, p.xii）, Galilei & Guiducci（1960, p. 24）. ^ Sharratt（1994, p. 135）, Drake（1960, p.xvii）. ^ Drake（1978, p. 494）, Favaro（1896, 6:111）. The pseudonym was a slightly imperfect anagram of Oratio Grasio Savonensis, a latinised version of his name and home town. ^ Sharratt（1994, p. 137）, Drake（1957, p. 227）. ^ Sharratt（1994, pp. 175–78）, Blackwell（2006, p. 30）. ^ Brodrick（1965, c1964, p. 95）quoting Cardinal Bellarmine's letter to Foscarini, dated 12 April 1615. Translated from Favaro（1902, 12:171–172） (Italian). ^ Galileo Galilei – New Mexico Museum of Space History. Retrieved 26 August 2011. ^ "Galileo Project – Pope Urban VIII Biography". ^ See Langford（1966, pp. 133–134）, and Seeger（1966, p. 30）, for example. Drake（1978, p. 355）asserts that Simplicio's character is modelled on the Aristotelian philosophers, Lodovico delle Colombe and Cesare Cremonini, rather than Urban. He also considers that the demand for Galileo to include the Pope's argument in the Dialogue left him with no option but to put it in the mouth of Simplicio（Drake, 1953, p. 491）. Even Arthur Koestler, who is generally quite harsh on Galileo in The Sleepwalkers (1959), after noting that Urban suspected Galileo of having intended Simplicio to be a caricature of him, says "this of course is untrue"（1959, p. 483）. ^ Sharratt（1994, pp. 171–75）; Heilbron（2010, pp. 308–17）; Gingerich（1992, pp. 117–18）. ^ Fantoli（2005, p. 139）, Finocchiaro（1989, pp. 288–293）. Finocchiaro's translation of the Inquisition's judgement against Galileo is available on-line. "Vehemently suspect of heresy" was a technical term of canon law and did not necessarily imply that the Inquisition considered the opinions giving rise to the verdict to be heretical. The same verdict would have been possible even if the opinions had been subject only to the less serious censure of "erroneous in faith"（Fantoli, 2005, p. 140; Heilbron, 2005, pp. 282–284）. ^ Finocchiaro（1989, pp.38, 291, 306）. Finocchiaro's translation of the Inquisition's judgement against Galileo is available on-line. ^ Drake（1978, p. 367）, Sharratt（1994, p. 184）, Favaro（1905, 16:209, 230，Italian). See Galileo affair for further details. ^ Drake（1978, p. 356）. The phrase "Eppur si muove" does appear, however, in a painting of the 1640s by the Spanish painter Bartolomé Esteban Murillo or an artist of his school. The painting depicts an imprisoned Galileo apparently pointing to a copy of the phrase written on the wall of his dungeon（Drake, 1978, p. 357）. ^ William Shea, M. A. The Galileo Affair 2006. Available online William Shea (January 2006). "The Galileo Affair". Grupo de Investigación sobre Ciencia, Razón y Fe (CRYF). Unpublished work. Retrieved 12 September 2010. ^ Stephen Hawking, ed. p. 398, On the Shoulders of Giants: "Galileo ... is the father of modern physics—indeed of modern science"—Albert Einstein. ^ Carney, Jo Eldridge (2000). Renaissance and Reformation, 1500–1620: a. Greenwood Publishing Group. ISBN 978-0-313-30574-0. ^ King（2003, pp.30–32）. The Netherlands States-General would not grant Lippershey his requested patent（King, 2003, p.32）. ^ According to Walusinsky（1964, p. 273）, it "aroused the life-long enmity of all the opponents of modern science"
^ In Sidereus Nuncius（Favaro,1892, 3:81（Latin）) Galileo stated that he had reached this conclusion on 11 January. 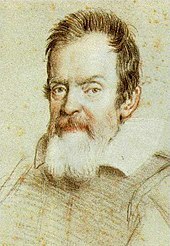 Drake（1978, p. 152）, however, after studying unpublished manuscript records of Galileo's observations, concluded that he did not do so until 15 January. ^ Linton（2004, pp. 98,205）, Drake（1978, p. 157）. ^ Drake（1978, pp. 158–68）, Sharratt（1994, pp. 18–19）. ^ Drake（1978, p. 168）, Sharratt（1994, p. 93）. ^ Thoren (1989), p. 8; Hoskin (1999) p. 117. ^ In Kepler's Thomist 'inertial' variant of Aristotelian dynamics as opposed to Galileo's impetus dynamics variant all bodies universally have an inherent resistance to all motion and tendency to rest, which he dubbed 'inertia'. This notion of inertia was originally introduced by Averroes in the 12th century just for the celestial spheres in order to explain why they do not rotate with infinite speed on Aristotelian dynamics, as they should if they had no resistance to their movers. And in his Astronomia Nova celestial mechanics the inertia of the planets is overcome in their solar orbital motion by their being pushed around by the sunspecks of the rotating sun acting like the spokes of a rotating cartwheel. And more generally it predicted all but only planets with orbiting satellites, such as Jupiter for example, also rotate to push them around, whereas the Moon, for example, does not rotate, thus always presenting the same face to the Earth, because it has no satellites to push around. These seem to have been the first successful novel predictions of Thomist 'inertial' Aristotelian dynamics as well as of post-spherist celestial physics. In his 1630 Epitome（See p514 on p896 of the Encyclopædia Britannica 1952 Great Books of the Western World edition）Kepler keenly stressed he had proved the Sun's axial rotation from planetary motions in his Commentaries on Mars Ch 34 long before it was telescopically established by sunspot motion. ^ Drake（1978, p. 209）. Sizzi reported the observations he and his companions had made over the course of a year to Orazio Morandi in a letter dated 10 April 1613（Favaro,1901, 11:491 （Italian）). Morandi subsequently forwarded a copy to Galileo. ^ In geostatic systems the apparent annual variation in the motion of sunspots could only be explained as the result of an implausibly complicated precession of the Sun's axis of rotation（Linton, 2004, p. 212; Sharratt, 1994, p. 166; Drake, 1970, pp. 191–196）. This did not apply, however, to the modified version of Tycho's system introduced by his protegé, Longomontanus, in which the Earth was assumed to rotate. Longomontanus's system could account for the apparent motions of sunspots just as well as the Copernican. ^ Graney（2010, p. 455）; Graney & Grayson（2011, p. 353）. ^ Van Helden,（1985, p. 75）; Chalmers,（1999, p. 25）; Galilei（1953, pp. 361–62）. ^ Finocchiaro（1989, pp. 167–76）, Galilei（1953, pp. 359–60）, Ondra（2004, pp. 74–5）. ^ Graney（2010, p. 454-462）; Graney & Grayson（2011, p. 352-355）. ^ Sobel（2000, p. 43）, Drake（1978, p. 196）. In the Starry Messenger, written in Latin, Galileo had used the term "perspicillum". ^ Drake（1978, p. 289）, Favaro（1903, 13:177，Italian). ^ "brunelleschi.imss.fi.it "Il microscopio di Galileo""（PDF）. ^ Van Helden, Al. Galileo Timeline (last updated 1995), The Galileo Project. Retrieved 2007-08-28. See also Timeline of microscope technology. ^ Newton, R. G.（2004）. Galileo's Pendulum: From the Rhythm of Time to the Making of Matter. Harvard University Press. p. 51.ISBN 978-0-674-01331-5. ^ Galileo Galilei, Two New Sciences,（Madison: Univ. of Wisconsin Pr., 1974）p. 50. ^ Hammer Versus Feather on the Moon. ^ Drake（1978, pp. 19,20）. At the time when Viviani asserts that the experiment took place, Galileo had not yet formulated the final version of his law of free fall. He had, however, formulated an earlier version which predicted that bodies of the same material falling through the same medium would fall at the same speed（Drake, 1978, p. 20）. ^ Groleau, Rick. "Galileo's Battle for the Heavens. July 2002". Ball, Phil (2005-06-30). "Science history: setting the record straight. 30 June 2005". The Hindu（Chennai, India）. ^ Galileo Galilei: The Falling Bodies Experiment. Last accessed 26 Dec 2011. ^ Lucretius, De rerum natura II, 225–229; Relevant passage appears in: Lane Cooper, Aristotle, Galileo, and the Tower of Pisa（Ithaca, N.Y.: Cornell University Press, 1935）, p. 49. ^ Simon Stevin, De Beghinselen des Waterwichts, Anvang der Waterwichtdaet, en de Anhang komen na de Beghinselen der Weeghconst en de Weeghdaet [The Elements of Hydrostatics, Preamble to the Practice of Hydrostatics, and Appendix to The Elements of the Statics and The Practice of Weighing]（Leiden, Netherlands: Christoffel Plantijn, 1586）reports an experiment by Stevin and Jan Cornets de Groot in which they dropped lead balls from a church tower in Delft; relevant passage is translated in: E. J. Dijksterhuis, ed., The Principal Works of Simon Stevin Amsterdam, Netherlands: C. V. Swets & Zeitlinger, 1955 vol. 1, pp. 509, 511. ^ Sharratt（1994, p. 203）, Galilei（1954, pp. 251–54）. ^ Sharratt（1994, p. 198）, Galilei（1954, p. 174）. ^ Clagett（1968, p. 561）. Oresme, however, regarded this discovery as a purely intellectual exercise having no relevance to the description of any natural phenomena, and consequently failed to recognise any connection with the motion of falling bodies（Grant, 1996, p.103）. ^ Sharratt（1994, p. 198）, Wallace（2004, pp.II 384, II 400, III 272）Soto, however, did not anticipate many of the qualifications and refinements contained in Galileo's theory of falling bodies. He did not, for instance, recognise, as Galileo did, that a body would only fall with a strictly uniform acceleration in a vacuum, and that it would otherwise eventually reach a uniform terminal velocity. ^ Two of his non-scientific works, the letters to Castelli and the Grand Duchess Christina, were explicitly not allowed to be included（Coyne 2005, p. 347）. ^ Heilbron（2005, p. 307）; Coyne（2005, p. 347）The practical effect of the ban in its later years seems to have been that clergy could publish discussions of heliocentric physics with a formal disclaimer assuring its hypothetical character and their obedience to the church decrees against motion of the earth: see for example the commented edition (1742) of Newton's 'Principia' by Fathers Le Seur and Jacquier, which contains such a disclaimer（'Declaratio'）before the third book (Propositions 25 onwards) dealing with the lunar theory. ^ An earlier version had been delivered on 16 December 1989, in Rieti, and a later version in Madrid on 24 February 1990（Ratzinger, 1994, p. 81）. According to Feyerabend himself, Ratzinger had also mentioned him "in support of" his own views in a speech in Parma around the same time（Feyerabend, 1995, p. 178）. ^ 187.0 187.1 187.2 Ratzinger（1994, p. 98）. ^ "Vatican admits Galileo was right". New Scientist (1846). 1992-11-07. Retrieved 2007-08-09..
^ "Papal visit scuppered by scholars". BBC News. 2008-01-15. Retrieved 2008-01-16. ^ Owen & Delaney (2008). ^ "Pope praises Galileo's astronomy". BBC News. 2008-12-21. Retrieved 2008-12-22. ^ Bohemian Rhapsody. everything2. Retrieved 2010-08-20. ^ Stavis, Barrie. Lamp at Midnight. South Brunswick, New Jersey: A.S. Barnes, 1966. ^ Lalonde, Robert. Galileo Galilei/Vesalius and Servetus. February 2008. ISBN 978-0-9783909-1-4. ^ Robinson, Kim Stanley (2009). Galileo's Dream. New York: Ballantine Books. ISBN 978-0-553-80659-5. ^ Hydrostatic balance. The Galileo Project. Retrieved 2008-07-17. ^ The Works of Galileo. The University of Oklahoma, College of Arts and Sciences. Retrieved 2008-07-17. ^ Sunspots and Floating Bodies. The University of Oklahoma, College of Arts and Sciences. Retrieved 2008-07-17. ^ Galileo, Letter to the Grand Duchess Christina. The University of Oklahoma, College of Arts and Sciences. Retrieved 2008-07-17. ^ Galileo's Theory of the Tides. The Galileo Project. Retrieved 2008-07-17. ^ Galileo Timeline. The Galileo Project. Retrieved 2008-07-17. 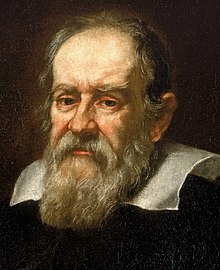 ^ Galileo Galilei. Tel-Aviv University, Science and Technology Education Center. Retrieved 2008-07-17. ^ "Collection of Galileo Galilei's Manuscripts and Related Translations". Retrieved 2009-12-04. ^ Adam, Mosley. Tycho Brahe. Starry Messenger. History & Philosophy of Science Dept, University of Cambridge. [13 January 2012]. Allan-Olney, Mary. The Private Life of Galileo: Compiled primarily from his correspondence and that of his eldest daughter, Sister Maria Celeste. Boston: Nichols and Noyes. 1870 [2008-06-09]. Altieri Biagi, Maria Luisa. Galileo e la terminologia tecnico-scientifica. Florence: L. S. Olschki. 1965. LCCN 71019084. IT\ICCU\SBL\0272939. Biagioli, Mario. Galileo, Courtier: The Practice of Science in the Culture of Absolutism. Chicago, IL: University of Chicago Press. 1993. ISBN 0-226-04559-5. Blackwell, Richard J. Behind the Scenes at Galileo's Trial. Notre Dame, IN: University of Notre Dame Press. 2006. ISBN 0-268-02201-1. Brodrick, James, S. J. Galileo: the man, his work, his misfortunes. London: G. Chapman. 1965. Chalmers, Alan Francis. What is this thing called Science? third. University of Chicago Press. 1999 . ISBN 978-0-7022-3093-6. Clagett, Marshall（editor & translator）. Nicole Oresme and the Medieval Geometry of Qualities and Motions; a treatise on the uniformity and difformity of intensities known as Tractatus de configurationibus qualitatum et motuum. Madison, WI: University of Wisconsin Press. 1968. ISBN 0-299-04880-2. Clavelin, Maurice. The Natural Philosophy of Galileo. MIT Press. 1974. Coffa, J. Galileo's Concept of Inertia. Physis Riv. Internaz. Storia Sci. 1968, 10: 261–281. Consolmagno, Guy; Schaefer, Marta. Worlds Apart, A Textbook in Planetary Science. Englewood, New Jersey: Prentice-Hall. 1994. ISBN 0-13-964131-9.
Cooper, Lane. Aristotle, Galileo, and the Tower of Pisa. Ithaca, NY: Cornell University Press. 1935. ISBN 1-4067-5263-0. Coyne, George V., S.J. The Church's Most Recent Attempt to Dispel the Galileo Myth. In McMullin（2005, pp. 340–359）. 2005. Drabkin, Israel; Drake, Stillman (编). On Motion and On Mechanics. University of Wisconsin Press. 1960. ISBN 0-299-02030-4. Drake, Stillman. Notes to English translation of Galileo's Dialogue. In Galilei（1953, pp. 467–91）. 1953. Drake, Stillman. Discoveries and Opinions of Galileo. New York: Doubleday & Company. 1957. ISBN 0-385-09239-3. Drake, Stillman. Introduction to the Controversy on the Comets of 1618. In Drake & O'Malley（1960, pp.vii–xxv）. 1960. Drake, Stillman. Galileo Studies. Ann Arbor: University of Michigan Press. 1970. ISBN 0-472-08283-3. Drake, Stillman. Galileo's Discovery of the Law of Free Fall. Scientific American. 1973, 228 (5): 84–92. doi:10.1038/scientificamerican0573-84. Drake, Stillman. Galileo At Work. Chicago: University of Chicago Press. 1978. ISBN 0-226-16226-5. Drake, Stillman. Galileo: Pioneer Scientist. Toronto: The University of Toronto Press. 1990. ISBN 0-8020-2725-3. Drake, Stillman, and O'Malley, C.D.（translators）. The Controversy on the Comets of 1618. Philadelphia, PA: University of Pennsylvania Press. 1960. Drake, Stillman; Kowal, C. T. Galileo's Sighting of Neptune. Scientific American. 1980, 243 (6): 74–81. doi:10.1038/scientificamerican1280-74. Dugas, René. A History of Mechanics. Dover Publications. 1988 . ISBN 0-486-65632-2. Duhem, Pierre. Etudes sur Leonard de Vinci. 1906–13. Duhem, Pierre. Le Systeme du Monde. 1913. Duhem, Pierre. History of Physics. Catholic Encyclopedia. Einstein, Albert. Foreword. (编) Drake, Stillman. Dialogue Concerning the Two Chief World Systems. Berkeley, CA: University of California Press. 1953. ISBN 0-375-75766-X. Einstein, Albert. Ideas and Opinions. translated by Sonja Bargmann. London: Crown Publishers. 1954. ISBN 0-285-64724-5. Fantoli, Annibale. Galileo: For Copernicanism and the Church third English. Vatican Observatory Publications. 2003. ISBN 88-209-7427-4. Fantoli, Annibale. 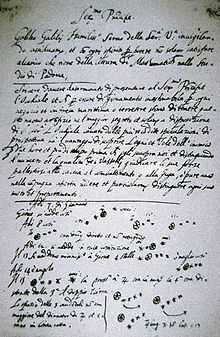 The Disputed Injunction and its Role in Galileo's Trial. In McMullin（2005, pp. 117–149）. 2005. Favaro, Antonio (编). Le Opere di Galileo Galilei, Edizione Nazionale [The Works of Galileo Galilei, National Edition]. Florence: Barbera. 1890–1909; reprinted 1929–1939 and 1964–1966. ISBN 88-09-20881-1. （原始内容存档于2007-07-13） （意大利语）. 请检查|date=中的日期值 (帮助) A searchable online copy is available on the Institute and Museum of the History of Science, Florence, and a brief overview of Le Opere is available here. Feyerabend, Paul. Againat Method. Verso. 1975. Feyerabend, Paul. Killing Time: The Autobiography of Paul Feyerabend. Chicago, MI: University of Chicago Press. 1995. ISBN 0-226-24531-4. Fillmore, Charles. Metaphysical Bible Dictionary 17th. Unity Village, Missouri: Unity House. July 2004 . ISBN 0-87159-067-0. Finocchiaro, Maurice A. Galileo on the world systems: a new abridged translation and guide. Berkeley and Los Angeles, CA: University of California Press. 1997. ISBN 0-520-20548-0. Finocchiaro, Maurice A. The Galileo Affair: A Documentary History. Berkeley, CA: University of California Press. 1989. ISBN 0-520-06662-6. Finocchiaro, Maurice A. Book Review—The Person of the Millennium: The Unique Impact of Galileo on World History. The Historian. Fall 2007, 69 (3): 601–602. doi:10.1111/j.1540-6563.2007.00189_68.x. Galilei, Galileo. The Assayer. Translated by Stillman Drake. In Drake & O'Malley（1960, pp. 151–336）. 1960 . ISBN 1-158-34578-X. Galilei, Galileo. Dialogue Concerning the Two Chief World System. Translated by Stillman Drake. Berkeley, CA: University of California Press. 1953 . ISBN 0-520-00449-3. Galilei, Galileo. Crew, Henry; de Salvio, Alfonso, 编. Dialogues Concerning Two New Sciences. New York, NY: Dover Publications Inc. 1954 [1638, 1914]. ISBN 0-486-60099-8. Galilei, Galileo, and Guiducci, Mario. Discourse on the Comets. Translated by Stillman Drake. In Drake & O'Malley（1960, pp. 21–65）. 1960 . Galilei, Galileo; Scheiner, Christoph. On Sunspots. Translated and with and introduction by Eileen Reeves and Albert Van Helden. Chicago: University of Chicago Press. 2010. ISBN 978-0-226-70715-0.
von Gebler, Karl. Galileo Galilei and the Roman Curia. London: C.K. Paul & Co. 1879. ISBN 0-915172-11-9. Gingerich, Owen. The Great Copernican Chase and other adventures in astronomical history. Cambridge, MA: Cambridge University Press. 1992. ISBN 0-521-32688-5. Graney, Christopher M. The Telescope Against Copernicus: Star Observations by Riccioli Supporting a Geocentric Universe. Journal for the History of Astronomy. 2010, 41 (4): 453–467. Bibcode:2010JHA....41..453G. Graney, Christopher M.; Grayson, Timothy P. On the Telescopic Disks of Stars: A Review and Analysis of Stellar Observations from the Early Seventeenth through the Middle Nineteenth Centuries. Annals of Science. 2011, 68 (3): 351–373. doi:10.1080/00033790.2010.507472. Grant, Edward. The Foundations of Modern Science in the Middle Ages: Their Religious, Institutional, and Intellectual Contexts. Cambridge, UK: Cambridge University Press. 1996. ISBN 0-521-56762-9. Grassi, Horatio. On the Three Comets of the Year MDCXIII. translated by C.D. O'Malley. In Drake & O'Malley（1960, pp. 3–19）. 1960a . Grassi, Horatio. The Astronomical and Philosophical Balance. translated by C.D. O'Malley. In Drake & O'Malley（1960, pp. 67–132）. 1960b . Hilliam, R., Galileo Galilei: Father of modern science, The Rosen Publishing Group, 2005, ISBN 978-1-4042-0314-3. Hawking, Stephen. A Brief History of Time. New York, NY: Bantam Books. 1988. ISBN 0-553-34614-8. Heilbron, John L. Censorship of Astronomy in Italy after Galileo. In McMullin（2005, pp. 279–322）. 2005. Heilbron, John L. Galileo. New York, NY: Oxford University Press. 2010. ISBN 978-0-19-958352-2. Jarrel, Richard A. The contemporaries of Tycho Brahe. In Taton and Wilson（1989, pp. 22–32）. 1989. Kelter, Irving A. The Refusal to Accommodate. Jesuit Exegetes and the Copernican System. In McMullin（2005, pp. 38–53）. 2005. King, Charles C. The History of the Telescope Dover reprint. Dover Publications. 2003 . ISBN 0-486-43265-3. Linton, Christopher M. From Eudoxus to Einstein—A History of Mathematical Astronomy. Cambridge: Cambridge University Press. 2004. ISBN 978-0-521-82750-8. McMullin, Ernan, ed. The Church and Galileo. Notre Dame, IN: University of Notre Dame Press. 2005. ISBN 0-268-03483-4. McMullin, Ernan,. The Church's Ban on Copernicanism, 1616. In McMullin（2005, pp. 150–190）. 2005a. Moss, Jean Dietz; Wallace, William. Rhetoric & dialectic in the time of Galileo. Washington D.C.: CUA Press. 2003. ISBN 0-8132-1331-2. Ondra, Leos. A New View of Mizar. Sky & Telescope. 2004年7月: 72–75. Owen, Richard. Catholic Church abandons plan to erect statue of Galileo. London: TimesOnline News. 2009-01-29 [2011-04-22]. Owen, Richard; Delaney, Sarah. Vatican recants with a statue of Galileo. London: TimesOnline News. 2008-03-04 [2009-03-02]. Remmert, Volker R. Galileo, God, and Mathematics. (编) Koetsier, Teun; Bergmans, Luc. Mathematics and the Divine. A Historical Study. Amsterdam: Elsevier. 2005: 347–360. Ratzinger, Joseph Cardinal. Turning point for Europe? The Church in the Modern World—Assessment and Forecast. translated from the 1991 German edition by Brian McNeil. San Francisco, CA: Ignatius Press. 1994. ISBN 0-89870-461-8. OCLC 60292876. Reston, Jr., James. Galileo: A Life. Beard Books. 2000. ISBN 1-893122-62-X. Seeger, Raymond J. Galileo Galilei, his life and his works. Oxford: Pergamon Press. 1966. ISBN 0-08-012025-3. Settle, Thomas B. An Experiment in the History of Science. Science. 1961, 133 (3445): 19–23. Bibcode:1961Sci...133...19S. PMID 17759858. doi:10.1126/science.133.3445.19. Sharratt, Michael. Galileo: Decisive Innovator. Cambridge: Cambridge University Press. 1994. ISBN 0-521-56671-1. Shea, William R. and Artigas, Mario. Galileo in Rome: The Rise and Fall of a Troublesome Genius. Oxford: Oxford University Press. 2003. ISBN 0-19-516598-5. 戴瓦·梭貝爾. Galileo's Daughter. London: Fourth Estate. 2000 . ISBN 1-85702-712-4. Taton, René (编). The Beginnings of Modern Science from 1450 to 1800. London: Thames and Hudson. 1964 . Taton, René; Wilson, Curtis (编). Planetary astronomy from the Renaissance to the rise of astrophysics Part A: Tycho Brahe to Newton. Cambridge: Cambridge University Press. 1989. ISBN 0-521-24254-1. Thoren, Victor E. Tycho Brahe. In Taton and Wilson（1989, pp. 3–21）. 1989. ISBN 0-521-35158-8. Van Helden, Albert. Galileo, telescopic astronomy, and the Copernican system. In Taton and Wilson（1989, pp. 81–105）. 1989. Van Helden, Albert. Measuring the Universe: Cosmic Dimensions from Aristarchus to Halley. University of Chicago Press. 1985. ISBN 0-226-84881-7. Wallace, William A. Domingo de Soto and the Early Galileo. Aldershot: Ashgate Publishing. 2004. ISBN 0-86078-964-0. Walusinsky, G. The Golden age of Observational Astronomy. In Taton（1964, pp. 268–286）. 1964 . White, Andrew Dickson. A History of the Warfare of Science with Theology in Christendom. New York: D. Appleton and Company. 1898. ISBN 0-7905-8168-X. White, Michael. Galileo: Antichrist: A Biography. London: Weidenfeld & Nicolson. 2007. ISBN 978-0-297-84868-4. Wisan, Winifred Lovell. Galileo and the Process of Scientific Creation. Isis. 1984, 75 (2): 269–286. doi:10.1086/353480. Zik, Yaakov. Science and Instruments: The telescope as a scientific instrument at the beginning of the seventeenth century. Perspectives on Science. 2001, 9 (3): 259–284. doi:10.1162/10636140160176143.